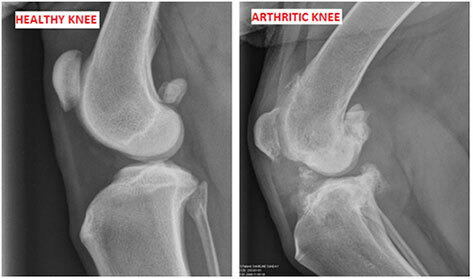 Arthritis — Welcome to P.A.H. Arthritis is a degenerative disease of the joints that is chronic and progressive. It can be caused by many things including poor conformation (hip dysplasia, elbow dysplasia, luxating patellas), infectious diseases such as those spread by ticks, auto-immune diseases, as well as trauma and injuries such as anterior cruciate ligament tears. There is no "cure" for arthritis once it occurs. However, there are many treatment options available to help alleviate the symptoms and perhaps even slow the progression of the disease. Following is a list of potential treatment options. There is a vast amount of joint supplements on the market for your pet. Studies can vary on the benefits of these supplements but it is generally recognized that most pets will improve with their use. These supplements will include ingredients such as glucosamine, chondroitin sulfate, MSM, avocado extract, paprika extract, among others. Here are PAH we carry a product called Phycox Chews as we have found this product to have the greatest benefit to most animals. We also carry a gel formula for cats. It is important to note that OTC nutraceuticals have no quality control oversite regulatory process. Therefore, it is important to purchase products from companies that partake in third party quality control testing. The newest supplement with anecdotal stories of improvement is with CBD oil. As with all OTC supplements quality control is going to be an issue so make sure you do your due diligence of research for a product that does independent quality control testing. NSAIDS are potent medications used to control pain and inflammation. They work by blocking different inflammatory pathways within the body. There are many different brands of NSAIDS on the market that are approved for use in veterinary medicine including Rimadyl, Previcox, and Metacam. Each one blocks a slightly different inflammatory pathway and that is why one brand may work better than another for an individual pet. For example, in people Ibuprofen may work better for them than Aleve. NSAIDS should NEVER be given with aspirin or steroids. When an animal is to be placed on an NSAID for chronic use (daily or even every other day) we strongly recommend having bloodwork performed one month after starting the medications and then repeated on a yearly basis. This is to monitor for side effects such as liver and kidney problems that can be associated with chronic use of these medications. Never use human NSAID products such as Ibuprofen or Acetaminophen with your pets. These can be toxic to your pet. There are times when additional pain medications need to be administered if the pet's discomfort progresses past what is controlled with conventional NSAID therapy. These medications are extremely potent and include Tramadol, Buprenex, and Gabapentin. Often times combination pain management therapy is needed for advanced arthritic pain with an NSAID, tramadol and/or gabapentin. Adequan is an injectable drug that has shown great promise for the vast majority of dogs with arthritis. It is a polysulfated glycosaminoglycan that is believed to aid in arthritis by blocking certain inflammatory cells within the joint and thereby protecting cartilage. The injections are given either subcutaneously or in the muscle and administered twice a week for four weeks. After the initial month follow-up injections are usually given once monthly to help maintain a healthier joint. Acupuncture is an ancient Chinese therapy used for all medical conditions including arthritis. The theory behind acupuncture is to release stagnation (pain and inflammation) at certain regions (meridians) along the body. Treatments are usually given on a weekly basis for 4 weeks and most dogs and cats tolerate the needles quite well. It is amazing how beneficial massage, heat therapy and physical therapy can be for an arthritic animal (and human!). Massage should be performed above the affected joint(s) while the animal is in a relaxed state. Heat can be applied using heating pads or warm bags of rice. Just be careful to monitor the temperature as to not cause a burn. Physical therapy includes exercise such as walking, passive range of motion exercises, and swimming. Animal Rehabilitation and Wellness Hospital in Raleigh ((919) 861-5868) is a facility that is dedicated to the physical therapy of pets. It is of vital importance that your pet remains at an optimal weight to avoid excessive stress on their already strained joints. If your pet is greatly overweight he may need to be removed from commercial pet food and placed on the "Jenny Craig" of pet foods. These are prescription pet foods that are extremely calorie restricted and include diets such as Purina OM, Hill's W/D, and Royal Canin Weight Control. Other ways to help control calories is by reducing the quantity of pet food by 25% and replacing that portion with vegetables such as green beans, carrots, peas, and corn. In certain applications surgery may be warranted. There have been many surgical advances such a total hip replacements, Femoral Head Osteotomy (FHO) and knee surgery to repair damaged ligaments and tendons.